I’m hurtling through the vast, open sky, the green canvas of the ground beneath me flying euphorically below. It’s like a dream. I’m the pilot of a Russian SU27 fighter-jet, and I’m about to come under trouble. Not from the impending enemies locked onto my plane; nor the extreme vertigo-triggering heights. As I swivel my joy-stick and swerve the plane in a loop through the abyss of cloud-filled blue, my head starts to implode. My senses don’t seem to correlate. The familiar fiend that is nausea erodes my psych and I have to escape. I purposefully crashed the plane into the beautiful, texturized ground. This seemed like a major obstacle for a wider embrace of virtual reality. With users strapped into a supposedly immersive environment, complaints that the very movement and actions of the experience is affecting the players health was troubling, stifling news for anybody in the industry. More than thirty percent of people suffer from dependable motion sickness, and a huge market of potential buyers could have been lost. But with the likes of Facebook and Playstation developing huge investments in the technology, there is a demand for solutions that makes progress steadfast. When users complain of VR sickness, what is occurring is that their body is struggling to compute its surroundings. It panics, becoming nauseous. This is made by a mismatching of the visual senses that usually keep your body stable. A conflict between the balancing systems of your inner ear, the clashing visuals you are experiencing, and the physical movements of your own body as you play the game. The word ‘nausea’ itself stems from the Latin language for ‘ship’. Ancient Greeks experienced motion sickness while sailing... as the interior of a ship appeared stable, their bodies rocked back and forth, and their minds were aware of such, giving them nausea. Isn’t language interesting? Even Achilles, son of Zeus, would’ve needed a migraine-tablet after a heavy session on the Oculus. Simulation sickness isn’t precisely common motion sickness. Motion sickness is typical with nausea, such as vomiting and stomach turbulence. Simulator sickness correlates with a disorientation of visual distress, like eye strain, headaches and difficulty focusing. Your body doesn’t know what is real, and is trying to tell you that it's distressed from what it is experiencing. In the late 1970’s, this stemmed a theory that our simulation sickness originates from our primal age, when we apparently used the nausea as a way of telling our bodies it had ingested something hallucinatory… a disputed concept that itself possibly found conception from hallucinatory substances, dude. Either way, research isn’t clear on its origins. That doesn’t mean we aren't closer to an answer. 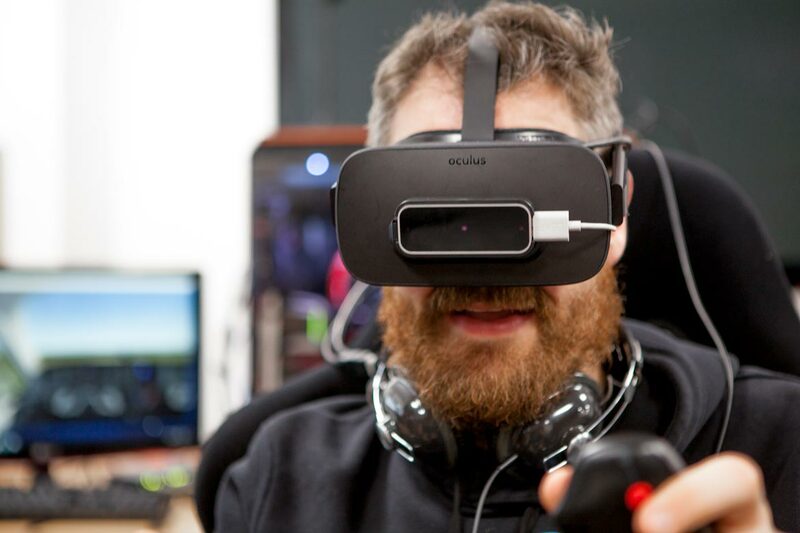 VR creators are giving users a sense of their “sea legs”. Much as people say about my own personal company: the more prolonged experiences you have to it, the less affected you become. Your brain develops a mechanism that negotiates the visual stimuli in order to frequently tolerate and adjust to virtual reality. This makes simulation sickness much easier to combat from a software and developer standpoint when designing these games for users. The issues are more psychological, rather than physiological. This means that continuously playing virtual reality with regularly advised breaks will eventually overcome initial sickness. As with any videogame, lag has always been an issue that has been the bane of many a gamers hardware and sanity. Lag in virtual reality attributes to VR sickness because the computer-visualised movement against the stable motion of the user don’t match up and this causes the brain its initial stress. As one moves their head, the lag may move at a slower rate and the immersive reality is distracted. Things don’t line up correctly. You may have experienced it in the dark confines of the cinema when a film is playing: you are sat steady, while the movie may show extreme motion (Gravity nearly made me vomit in 3D… but I still saw it twice). Producers and developers have found several answers. Approved games now have comfort ratings, so, if you are prone to nausea, you will be able to figure out which games are suited for you. Changing the games frame-rates decreases motion sickness; minimizing the force of acceleration to be more controllable by the user in-game, as well as the overall degree of control by the user for the entire experience, also fixed any sickness amongst players, with refreshed loading rates on graphics becoming more and more impressive. On the correct headsets, images don’t appear too close and it fixes the field of view for users, so that your brain will configure the experience at a much better rate. At Novatech, we’ve been spending a lot of time with virtual reality. Developing it as a care-free experience has been a huge priority for both business and our own pleasure. I mean, we spend enough time on it! 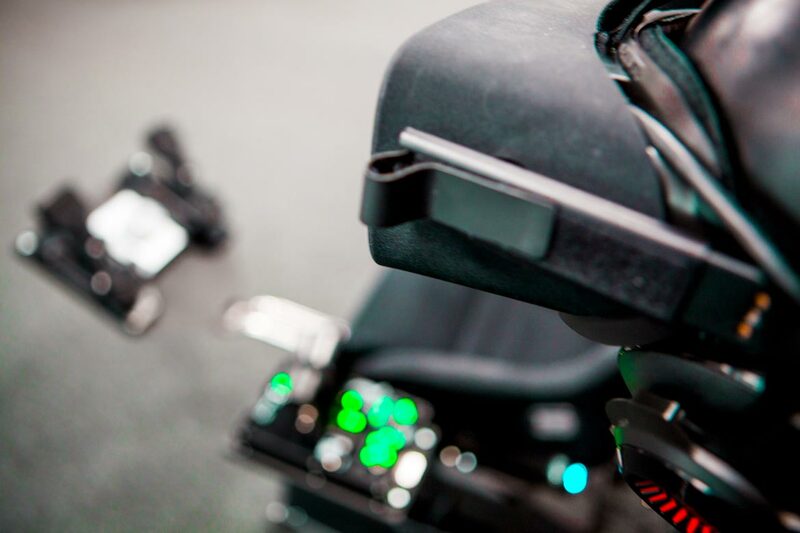 Our Atomic A3 simulator configures with the motion of a virtual reality experience, moving the user in correlation to the actions of the game itself. Any nausea is eliminated as your body and brain is immersed in the experience, especially with driving and motion games. One of our colleagues even used wooden spoons to recreate a planes joystick! Spending my entire Monday morning hooked up to one of the simulators (it’s a hard life, but somebody has to do it), there was a definite difference between using the motion of the chair, and playing VR without it. The nausea was more prominent when my body was motionless and stable, simply sat. But once the chair simulated my own movements in the game, the sickness was seemingly eliminated. The virtual became reality. Watching a movie in 3D gives me a violent headache. Playing am FPS game like Unreal Tournament make me violently ill as if I've been on the Waltzers for an hour. VR? Forget it! I'd puke within 20 minutes! It's just a fad that will never be mainstream. Nobody really wants to spend £100s and wear cumbersome, heavy, sweaty and nausea inducing headsets for a 5 minute wow factor. Part of the problem is the stupidity of the over exaggerated head movements. If I want to look at someone/thing to my left I use my eyes, I don't (unless it's more the 70 degrees to left swing my head around. Same goes for looking up and down. You move your eyes, not throw your head around. In VR, you have to over exaggerate all your head movements wearing a cumbersome headset. It's no wonder people get sick using the stupid things. I'll stuck to a widescreen monitor where my eyes do the moving and not throw my head around.